FIG. 3-3 The mast step is any receptacle that maintains the position of the mast in the boat. 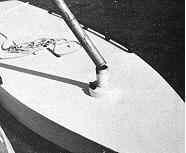 This sailboard has a mast which consists of a piece of ordinary pipe used to receive the tubular aluminum mast. 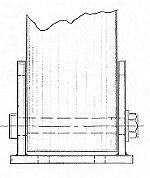 The base of the mast always fits into some type of receptacle or apparatus which is called the MAST STEP. Many types of mast steps are used depending on the configuration desired. Putting the mast in position on the mast step is called STEPPING the mast (see Fig. 9-1). Some masts go through holes in the deck or cabin top and step onto the hull structure, while others bear directly on the deck or cabin top. 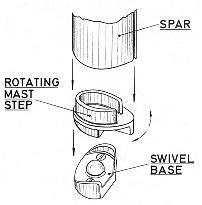 The simplest type of mast step is the fixed type such as shown by Figs. 3-3 and 3-4. The mast is fixed in position on the step and no movement of the mast is possible, short of removing the mast. Most masts stepped through the deck use fixed steps. Another type is the rotating mast step shown in Fig. 3-5. This type allows the mast to turn or rotate with the direction of the mainsail for greater sail efficiency. 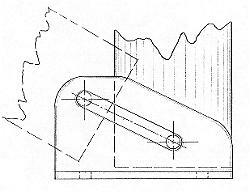 A convenient type of mast step, as far as ease of stepping the mast is concerned, is the pivoting type such as shown in Fig. 3-6. This type allows the mast to be laid into the step fitting, bolted, and pivoted up in position, as opposed to trying to lift it onto the step, which can be tricky, especially on a windy day or if it is a tall mast. With lightweight aluminum spars, it is desirable to use a mast base stiffener at the step when using the pivoting step in order to provide adequate bearing for the pivot bolt. Many masts require extra reinforcement, and one method of doing this is by utilizing SPREADERS. These are cross members located on the mast at a predetermined location and jutting out sideways. 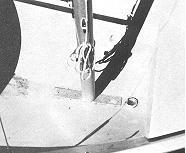 Spreaders are always arranged in pairs, one on each side of the mast. The spreaders "push out" or spread the SHROUDS (the wires supporting the mast from the sides; see Chapter 4) to help stiffen the mast. While spreaders can be made of wood, it is common on small sailboats to have them made of metal tubing, usually stainless steel or aluminum, even when wood masts are used. Some boats do not have any spreaders, while others may have one, two, or more sets. Since spreaders are a necessary evil, (they get in the way and foul things aloft, not to mention added resistance and weight), it is best to have as few as possible. FIG. 3-4 This GLEN-L 11 has an adjustable mast step arrangement that allows the boat to be sailed as a cat rig when the mast is moved forward onto the fixed step (to the right), or as a sloop rig when the mast is moved aft along the metal bar base. FIG. 3-5 A rotating mast step allows the mast to turn with the boom and sail. This type of step can only be used on certain rigs as all the stays must be arranged in a way to permit the mast to turn.